Serve with mashed potatoes and roasted vegetables for a hearty dinner. Preheat the oven to 190°C/gas mark 5. Lightly grease a baking dish with butter. Cut the pork into roughly bite-sized medallions. Heat the olive oil in a non-stick pan set over a medium heat. Add the pork, onions, garlic, soy sauce and some salt and pepper and cook for about 10 minutes, until the pork is lightly browned on both sides. Add the chopped red pepper and rosemary and cook for 10 minutes more. In a bowl, mix the apple with the honey until all the chunks are nicely coated. Transfer the pork and vegetables from the pan into the buttered baking dish. Add the apples and mix well to combine everything together. Place a lid on the dish or cover tightly with tin foil. Bake for 10 minutes, then spoon the juices over the pork to add flavour and moisture to the meat. Cover the dish again and return to the oven to bake for 10 minutes more. 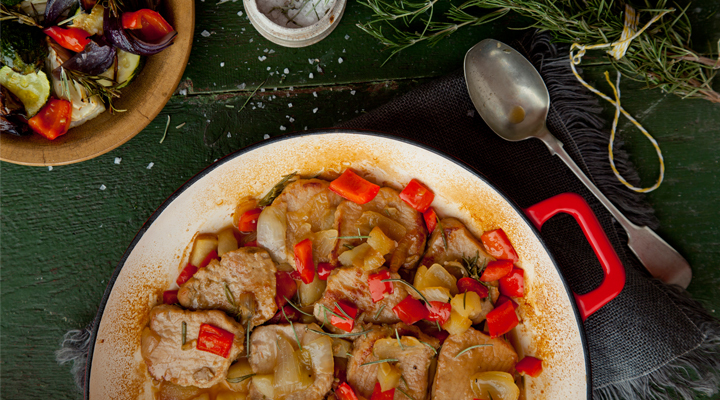 Serve the pork and apples with roasted vegetables and mashed potatoes.